Do a Google search for “portable workbench” and you’ll get about 12 million results, give or take. One of them is the Husky Portable Jobsite Workbench that you can pick from the Home Depot for about $80. Most portable workbenches aren’t just a portable workbench anymore. They have to compete in capacity, features, and price if they’re going to sell. The feature set takes things beyond the basics. The most eye-opening one is the router insert plate. That will make it a popular option in the woodworking crowd. Even better, the two slots you see in the top give you the ability to use a bar clamp or on the surface. It’s similar to benefits you get from Kreg’s Bench Clamp without having to do a permanent installation. You are limited to clamping along those slots, though. There are also metal brackets near each of the corners to accept 2 x 4s. 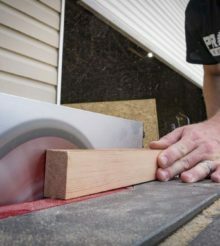 You can create makeshift miter saw stand extensions or even set a piece of plywood over the top if you need to make more surface area. Portable workbenches like this will usually have at least 500 pounds of capacity. The Husky Portable Jobsite Workbench is able to hoist 1500 pounds thanks to the use of heavy-duty metal legs. They’ll even support a car if you have 4 of them. Sound crazy? Tim Johnson set his Cadillac SRX on them! $80 is pretty reasonable given the materials and features Husky adds into the package. There’s a lot of competition on either side of the $100 mark and coming in below it will put a check in the win column against many competitors.